I think that Confeitaria Cunha (pronounced cun-ya) is famous. 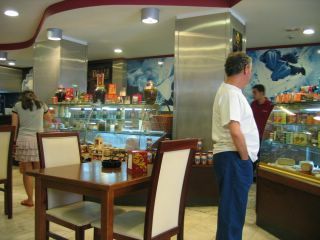 On our way to the hotel we asked our taxi driver to recommend a good confeitaria (aka pastry shop), and he suggested Cunha. (Well, I say "we asked", I really mean that Clarice spoke to him in Portuguese while I sat back, smiled and nodded). When we got to our hotel, we asked the reception staff to locate Cunha on the map, and they immediately knew where it was. 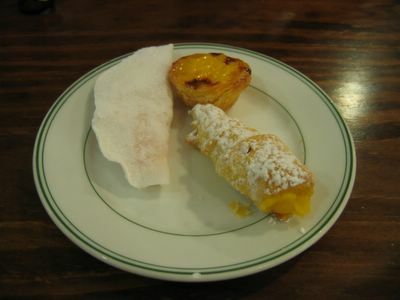 The point of all that is - if my directions make no sense to you and you're in Porto looking for pastries, just ask someone where Cunha is. Chances are they'll know. 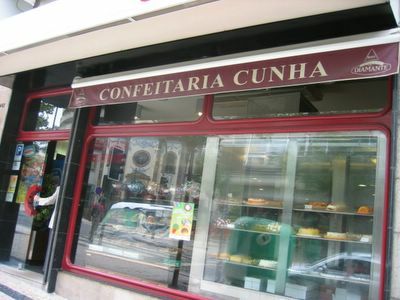 Confeitaria Cunha is on the Rua de Sá Bandeira, equidistant between Trinidade and Bolhão metro stations. 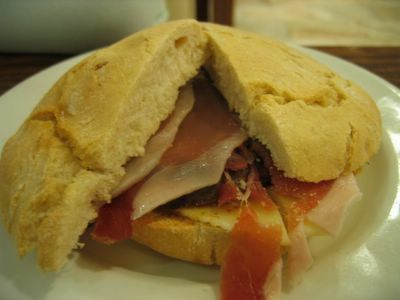 It's easy enough, however, to just walk north from the central San Bento station along Rua de Sá Bandeira for about 10 minutes. (Sounds complex, but just look at a map and it'll all make sense). We ended up coming here 3 times on our 2-day stay in Porto. I think the staff thought we were a little odd. They've got loads of packaged confectionary, freshly baked pastries and sweet-treats, a chacuterie/deli section, pre-made sandwiches, and fabulous coffee. 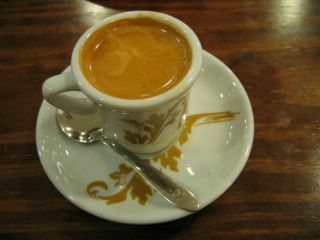 It kinda reminded me of a less-chaotic, Portuguese version of Brunetti in Melbourne. 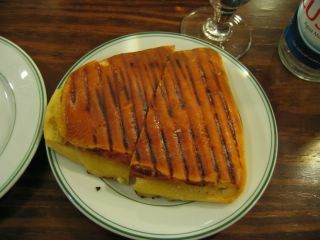 Here are a selection of things we ate in Cunha... On our last day, we stocked up for our train ride, but I'll save that for another post. Portuguese custard tart; mini donut filled with candied egg yolk. 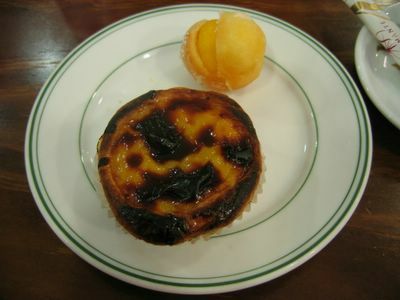 Portuguese custard tarts are da bomb. Candied egg yolk is pretty addictive too. It´s a shame that bolhão has been sold and will be transformed in offices, commercial galleries and a parking lot....it is a harsh cut in the city´s soul.